Classic negotiation ploy — say publically that you’ve received a lot of offers, that none are perfect. Makes it seem like there’s a lot of competition, and that the teams involved need to increase their offers if they want to end up with McNabb. The Eagles front office has really made sure they stay on top of the rumors circulating. Whenever something comes out that doesn’t benefit their side, there’s always a competing report to follow shortly. As Andrew Brandt makes the case for here, don’t get too worried about whether or not a deal will get done. These things can come together fast, and with enough players interested, something will get done. At this point the Eagles are pretty much committed to dealing their veteran quarterback. Yeah… pretty sure that’s moot at this point. Doesn’t seem like the Raiders are too concerned about McNabb not wanting to sign a long-term extension with them (unlike perhaps Buffalo), so I don’t see how Donovan thinks he can get out of playing for Oakland, if they make the best offer. 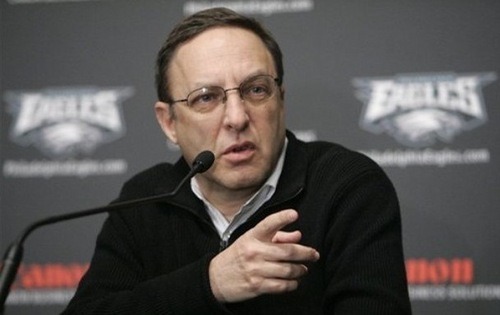 Tagged with Philadelphia Eagles, Front Office, Joe Banner, Andy Reid, Howie Roseman, Donovan McNabb, Trade Rumors, Trade Offers, Frontrunner, Negotiations. March 31, 2010 by Brian Solomon.